Hey Lovelies! Are you looking for a fun way to liven up your celebration? Try buttons and magnets! Buttons are making there way into all celebrations and it’s no wonder, they are too cute! We especially love them for weddings because they are a great way to show off your personality. Pin buttons can be used on so much to add that cute detail to your wedding. Use them on your boutonnieres to make them adorable or give them out as favors to give your guests a little bit of flavor of you and your sweetie. They really can be used in so many ways! Here are some of our favorites. Buttons totally work for all parties though! Commemorate your celebration with a button and give it out as a souvenir. They are fun and a different way to entertain your guests at your party. They bring that extra personality to your party that nothing else can. Just think about buttons for a bachelor or bachlorette party. So fun! We really do love buttons at celebrations! 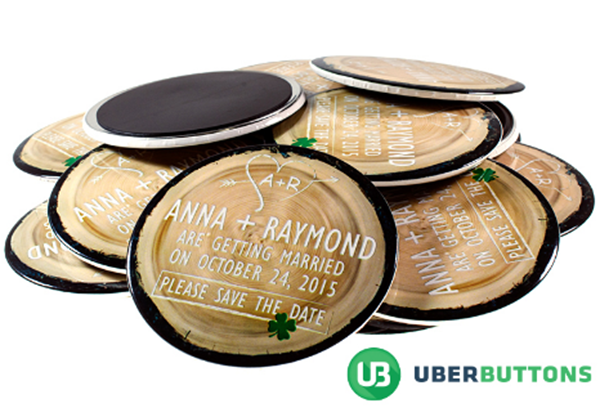 If you are looking for easy and inexpensive place to order custom buttons for your wedding or celebration, UberButtons is great. They make the whole ordering process fast, simple and painless. All you have to so is simply upload your design or a doc file with your requirements and within 24 hrs they will provide you a beautiful proof. Don’t have a design yet? They have a talented design staff on hand that can help you as well. What we also love is that they have so many different options to choose from. They have pin buttons, round buttons, square buttons, magnets, key chains, compact mirrors even coffee mugs. Talk about really livening up a party! We love the magnet options because they are great for save the dates or fun invites to your party. Save the date magnets are always a great idea for weddings so guests won’t forget your wedding date. Plus it s fun favor before the wedding even starts too. Magnet invites are a unique and lovely way to welcome your guests to your party too. It’s really sets the mood before they even step in the door. We really love all of the amazing customer service that UberButtons has too. They offer free shipping, free digital proofs and free basic design. All of their buttons and magnets have great details and great gloss finishes so you know you are getting a good product every time. 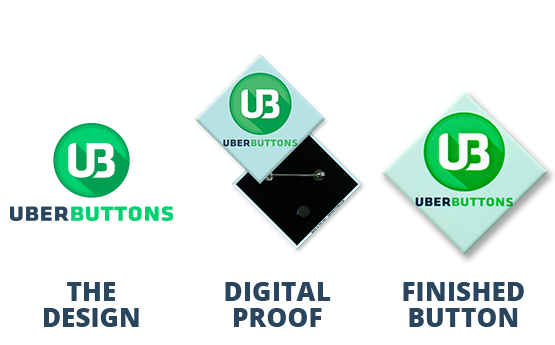 If you are looking to liven up your party or do something new and creative, UberButtons is it! Plus who can’t resist their adorable mustache mascot on everything! This post was sponsored on behalf of UberButtons. All opinions stated are my own. Thank you for supporting the sponsors that enable us to keep the lovely ideas and inspirations coming to you! Super Fun Wedding Hangover Kit! Trend Alert: Balloons With Words! Things We Love-Painted Dinosaurs! Find The Perfect Excuse To Have A Party With Small Moments!